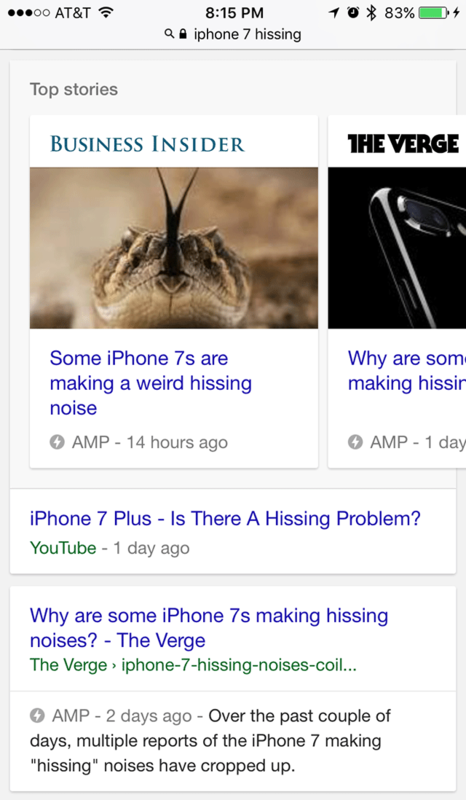 Home > Google News > Google AMP In Core Mobile Results Fully Live? In early August we reported Google is bringing AMP pages to the core mobile search results. Google never told us when this would happen exactly but it seems to have gone live today/tonight. Many folks are now seeing it for ordinary searches in Google while on their mobile devices. AMP pages would only show on mobile results, so that makes sense. For example, Glenn Gabe posted screen shots on Twitter of his own site's AMP version being listed in the core mobile search results. I then tried it myself tonight and I am able to see this site and other sites show up in the mobile results with the AMP logo and yes, clicking on it takes me to the AMP page. I've been seeing weird traffic data from Google Analytics for this site to my AMP pages, maybe this is why? Update: Google confirmed it 12 hours or so later.